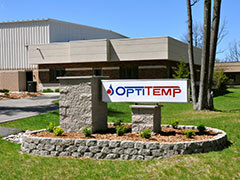 Our forward-thinking employees have made Opti Temp one of the leading manufacturers of innovative heat transfer solutions for a wide range of commercial, industrial, military, and laboratory applications. Individuals at Opti Temp come to work every day with creative problem solving ideas and with the help of a supportive team, they see these ideas come to life. Encouraging this kind of team-oriented environment does have its rewards; among them, being named one of Michigan’s top companies to watch in 2009 as part of the Michigan Celebrates Small Business Program. We value creative people with creative ideas, but at this time there are no openings at Opti Temp.